Tobacco consumption, in the form of direct and secondhand smoke accounts for nearly 6 million deaths worldwide annually and is increasingly becoming a serious public health concern. It is a potential risk factor for 6 out of the 8 leading causes of deaths worldwide  . Chronic abuse of tobacco in any form accounts for 1 out of 10 adult deaths with one person dying every 6 seconds. In spite of its deleterious effects on life and health, tobacco remains one of the most common forms of drug abuse. Of the 1 billion estimated smokers across the globe, more than 80% reside in developing or under-developed nations  . According to the World Health Organization (WHO), India accounts for 12% of the global smokers (approximately 120 million) with the highest number of cigarette smokers recorded in the state of Jammu and Kashmir , . It is predicted that tobacco deaths in India may exceed 1.5 million annually by 2020. 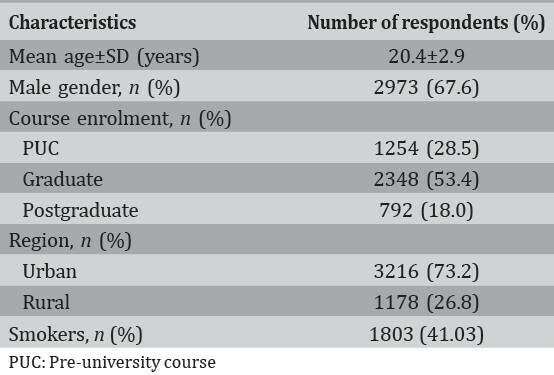 Considering the hazardous impact of smoking upon the health of an individual, the present study was conducted to evaluate the magnitude of this increasingly distressing public health concern among youngsters enrolled in university courses at various educational institutes in the state of Andhra Pradesh, India. The data on behavior of smoking pattern and the knowledge and attitude of youngsters toward smoking and its hazardous effects are presented in this paper. A cross-sectional questionnaire survey was conducted over a period of 13 months from November 1, 2011 to November 31, 2012 at various educational institutions in Andhra Pradesh, India. The study population included students enrolled in various university courses and were segregated into preuniversity course (PUC), graduate and post graduation categories. The legal and ethical considerations for the study were sought from the Institutional Ethical Committee at the St. Peter's Institute of Pharmaceutical Sciences, Vidyanagar, Hanamkonda, Warangal prior to the commencement of the survey. A well-structured and self-administered questionnaire with both, open- and close-ended questions was developed for the purpose of collection and assessment of data on behavior, knowledge, and attitude of youngsters toward smoking tobacco. Demographic data, including age, and gender, educational qualification, address, etc., were also recorded. Data collection was primarily done over the internet and manual survey. All the youngsters were surveyed using a self-administered questionnaire, which included questions based on behavior, knowledge and attitude toward smoking and also on the measures they would suggest to make youngsters avoid/quit smoking. Data were primarily collected from the students who are actively using their e-mail accounts, by providing them with the link to online questionnaire and were requested to respond. The paper forms were also taken to different colleges personally by field supervisors and were handed over to the students to express their views on smoking practice. The students were clearly explained about the main objective of the study and were assured that their responses would remain highly confidential. The forms were also distributed randomly to students who attended college technical fests and national conferences, which were held during the survey period. Youngsters who were unable to understand the questionnaire were explained in local language. For some of the interested youngsters who were working as employees, the paper forms were provided during their leisure and collected at the end of the day. The social networking sites were also used in order to circulate the questionnaire. All respondents were assured of anonymity about their responses. The questions included the number of cigarettes smoked per day, best time when they feel to smoke, history of smoking, source of their first cigarette, reasons for adoption and addiction, impact of friends on their smoking behavior, awareness regarding hazardous effects of smoking and passive smoking, attitude of smokers and nonsmokers toward smokers, suggested measures to quit smoking tobacco, if any. Prior to survey initiation, a pilot study with the designed questionnaire was conducted. The questionnaire was piloted and evaluated for its content using the method developed by Lynn  . An expert committee was established to evaluate the content. The committee was provided with a copy of the questionnaire, and objectives of the study with rationale for each question phrased. Following review, few changes were incorporated as suggested by the panel experts. The final questionnaire was classified into 4 major groups: attitude based questions; behavior-based questions; knowledge-based questions, and finally the suggested measures to avoid/quit smoking. The data collected following the survey was reviewed by field supervisors and entered into Microsoft͹ Excel. Data cleaning and editing were performed on a timely basis. To ensure adequate accuracy and reliability of the data, stringent quality assurance measures were followed at various stages of data handling. Percentages and proportions were calculated wherever appropriate. Percentage value was rounded off to first decimal digit. 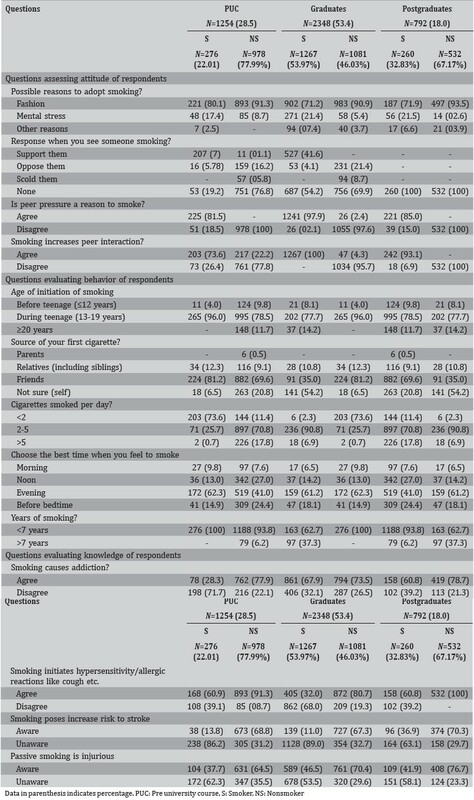 The baseline demographic characteristics of the study respondents are presented in [Table 1]. The mean age of the respondents was 20.4 ± 2.9 years and 67.6% were males. The overall smoking rate was found to be 41.03%, with highest prevalence observed amongst the male population 1621 (54.5%) in contrast to a tenth of the female population 182 (12.8%) admitting to smoking cigarette. Of the total respondents, 1254 (28.5%) were enrolled in PUC, whereas graduates and postgraduates constituted 2348 (53.4%) and 792 (18.0%), respectively. Response of the study groups to attitude-, behavior-, and knowledge-based questions are summarized in [Table 2]. A majority of smokers 1310 (72.6%) and nonsmokers 2373 (91.6%) stated that people adopt to smoking as a fashionable trend in contrast to a meager 532 (12.1%) respondents that thought people resorted to smoking as a stress suppressant. Almost less than half the respondents 1976 (44.9%) felt smoking cigarettes in a group increased interaction among their peers. Majority of the respondents 1462 (81.1%) confessed to initiation of smoking during their teenage years. An alarming group of respondents 1204 (66.8%) admitted to smoking up to 5 cigarettes in a day yet majority of the smokers 1097 (60.8%) and nonsmokers 1975 (76.2%) were aware of the fact nicotine in cigarettes causes addiction, only one-third of the respondents 1366 (31.1%) were unaware of its adverse systemic effects. Responses of the study groups suggesting measures to quit smoking are presented in [Table 3]. Majority of respondents 2582 (64.9%) recommended prohibition of smoking at public places. Among surveyed population, 2903 (66.1%) advised cigarettes should be made expensive to prevent youngsters from buying them which would subsequently decrease the rate of smoking among them. Most respondents 3832 (87.2%) sought counseling by a physician or a pharmacist as a valuable resource to help youngsters curb their smoking habits. Furthermore, the use of e-cigarettes has been suggested as an alternative measure to avoid tobacco smoking by a majority of interviewers 3386 (77.1%). The reported prevalence of smoking in Andhra Pradesh in the year 2003 was estimated to be 35.4%. National statistics revealed 47% men and 14% of women aged 15 years or above either smoked or chewed tobacco  . Our study focused on determining the rate of smoking among a cohort of youngsters studying at various institutes. The results of our survey demonstrated 41.03% of the participating youngsters admitting to smoking cigarettes. These numbers reflect a poor indicator of state health and a progressive increase from the national statistics as reported in the year 2003  . The study revealed attraction of the younger generation of the nation to smoking tobacco. The remarks that smoking is a fashionable act are disturbing and measures to discourage this should be undertaken. Efforts should be made to dissipate the belief that smoking is a part of life. Most smokers believed smoking increases their friend circle, which is another disappointing trend and needs to be discouraged. Majority of youngsters reported to not act while they come across an individual who is smoking. The attitude of not taking any adequate measures including but not limited to, counseling, educating and making the smoker understand and perceive about the deleterious effects of tobacco is concerning and could lead to disasters in health outcomes with an increase in the morbidity and overall mortality rates. Our study findings reveal the teenage sub group to be the most critical period where larger part of the youngsters adopted smoking. This reflects monitoring and counseling of the students at this stage of life regarding the harmful effects of smoking tobacco on the overall health of an individual may contribute to a decrease in smoking pattern and prevalence rates. The study population declared peer influence as a major contributory factor for smoking, thus implying that smoke adoption/initiation is similar to a chain like reaction. Optimistically, it can be hypothetically said that if at least one smoker in the peer circle is made to quit smoking tobacco, there exists a promising possibility that others in the group might eventually quit too. Most student respondents were aware of injurious effects posed by smoking cigarettes; however, preferred to continue to smoke. The patterns of responses regarding the knowledge of the hazardous effects of smoking varied between the students of PUC, graduates and the postgraduates. Though scientifically proven that nicotine in cigarettes causes addiction  , distressingly, 71.7% of the PUC respondents were not aware of this fact whereas an opposite trend was observed among the graduates and the postgraduates. While Jindal et. al. showed significant respiratory and cardiovascular morbidity associated with smoking  , other clinical studies showed association of psychiatric and neurologic disorders are associated with smoking , ; however in our study, the responses disclosed the lack of awareness of the youngsters toward this. A study conducted by Dworetzky et. al. on young adult women found current smokers to be 2-3 times more likely to suffer a seizure than nonsmokers and has proved smoking as an independent established risk factor to cause seizures  . Perhaps passive smoking also has been implicated in decrease quality of life and health related complications [11,12]. As per WHO report 2011, in India, more than one-quarter of all adults working indoors are exposed to secondhand smoke  . Frequent exposure to tobacco smoke, has been found to nearly double the risk of having a heart attack. Each year, exposure to secondhand smoke kills 600,000 people, with more than 80% owing to cardiovascular diseases alone, as reported by Oberg et. al.  . Due to incomplete and insufficient information, students should receive exclusive counseling regarding smoking and its harmful effects, ultimately helping them to overcome misbelieves and attractions towards smoking. A survey conducted in 1991 on college students has shown most to be unaware of the hazardous effects of smoking  . Most study respondents reported that statutory warning imprinted on the packet of cigarette was not a deterrent to help them quit smoking. The study population acceded that prohibition of smoking will help reduce the incidence and prevalence of smoking and requested to formulate stringent provisions against smoking in public places. While the critical suggestion to make cigarettes expensive was not welcomed by the smokers, the nonsmoking respondents sought this as a definitive measure that may help people quit smoking in concordance with few studies that confirmed a hike in price of 10% or more per cigar would decrease consumption by up to 8% , . Moreover, majority respondents agreed the influential role of social celebrities and advertisements on the impact of smoking practice among youngsters. 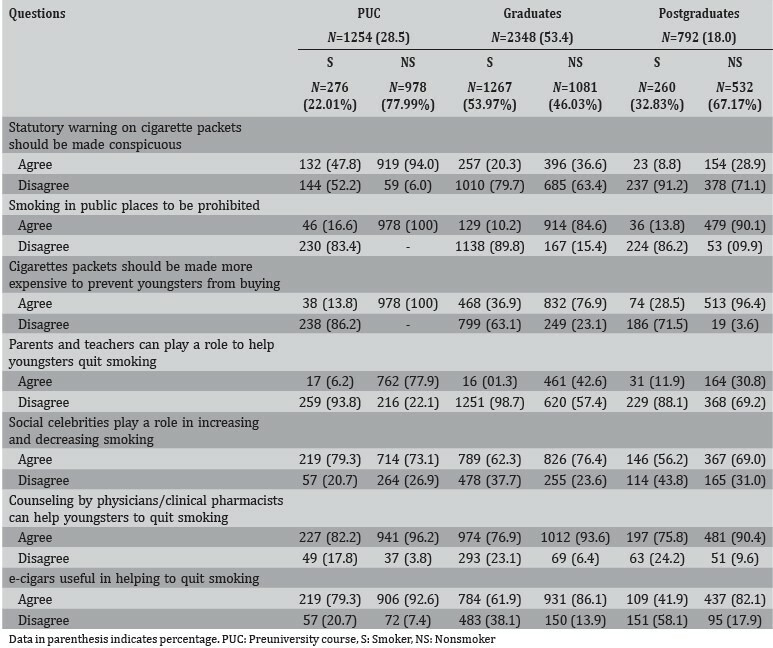 While most of the respondents felt no parental and/or faculty role could help in quit smoking, physician's intervention/advice was accepted as a useful tool to be considered to quit smoking owing to respect for people from the medical fraternity. Likewise, a survey among educated individuals indicated that clinical pharmacists are equally respected as much as physicians  and hence can also play a role in helping youngsters in educating about the effects of smoking. Diversified opinions were observed on the use of e-cigarettes as an alternative for smoking. While nonsmokers encouraged the use of e-cigarettes as they perceived it could help them escape from the deadly effects of active as well as passive smoking, a cohort of smokers rejected using them due to various reasons including high cost of e-cigarettes, in ability to charge the batteries when at home owing to parental fear, while some respondents were apprehensive as they thought e-cigarettes were more harmful and its potential to help people quit smoking has not been scientifically demonstrated  . Even though we employed a large population for our survey-based study, the sample size to represent the entire southern part of India to generalize with the results generated cannot be done with certainty. Moreover, one to one interaction with the respondents was not feasible owing to the large investment in time. To avoid complexity in results, occasional smokers were taken under the category of smokers, which could serve as a potential bias in the results obtained. Assessment of quitting rates or quit attempts were also not taken into account. A high percentage of youngsters admitting to smoking cigarettes as demonstrated from our survey highlights a poor indicator of national health status. Perhaps, it also reflects a failure of state government policies aimed to prevent tobacco use. Results from our survey serve as an efficient tool to identify the burden of tobacco consumption among young individuals. The need to formulate stringent policies to guide youngsters to understand the deleterious effects of tobacco, including but not limited to, advertisements, banners, setting up of de-addiction and counseling centers, national wide campaign and broadcasting, should be conducted. Further, research aimed at estimating the medical and economic burden of tobacco consumption and smoking is warranted to assess its grave impact on health care. 1. Global Status Report on Non-Communicable Diseases 2010 Description of the Global Burden of NCDs, their Risk Factors and Determinants. Available from: http://www.whqlibdoc.who.int/publications/2011/9789240686458_eng.pdf. [Last cited on 2013 Feb 11]. 2. WHO Report on the Global Tobacco Epidemic, 2013 Enforcing Bans on Tobacco Advertising, Promotion and Sponsorship. Available from: http://www.who.int/mediacentre/factsheets/fs339/en/index.html. [Last cited on 2013 Sep 03]. 3. GATS Report-Global Adult Tobacco Survey-India 2009-2010. Available from: http://www.who.int/tobacco/surveillance/en_tfi_india_gats_fact_sheet.pdf. [Last cited on 2013 Jul 18]. 4. Rani M, Bonu S, Jha P, Nguyen SN, Jamjoum L. Tobacco use in India: prevalence and predictors of smoking and chewing in a national cross sectional household survey. Tob Control 2003;12(4):e4. 5. Lynn MR. Determination and quantification of content validity. Nurs Res 1986;35(6):382-5. 6. American Cancer Society-Questions about Smoking, Tobacco, and Health. Available from: http://www.cancer.org/cancer/cancercauses/tobaccocancer/questionsaboutsmokingtobaccoandhealth/questions-about-smoking-tobacco-and-health-is-tobacco-addictive. [Last cited on 2014 Feb 26]. 7. Jindal SK, Aggarwal AN, Chaudhry K, et. al. Tobacco smoking in India: prevalence, quit-rates and respiratory morbidity. Indian J Chest Dis Allied Sci 2006;48(1):37-42. 8. Milberger S, Biederman J, Faraone SV, Chen L, Jones J. ADHD is associated with early initiation of cigarette smoking in children and adolescents. J Am Acad Child Adolesc Psychiatry 1997;36(1):37-44. 9. Neurological Disorders Public Health Challenges, World Health Organization; 2006. Available from: http://www.who.int/mental_health/neurology/neurological_disorders_report_web.pdf. [Last cited on 2013 Jan 12]. 10. Dworetzky BA, Bromfield EB, Townsend MK, Kang JH. A prospective study of smoking, caffeine, and alcohol as risk factors for seizures or epilepsy in young adult women: data from the Nurses' Health Study II. Epilepsia 2010;51(2):198-205. 11. Barnes DE, Bero LA. Why review articles on the health effects of passive smoking reach different conclusions. JAMA 1998;279(19):1566-70. 12. Centers for Disease Control and Prevention-Secondhand smoke affects millions in homes, vehicles. JAMA 2013;309(24):2544. Available from: http://www.jama.jamanetwork.com/article.aspx?articleid=1700509. [Last cited on 2013 Nov 10]. 13. World Health organization Report on the Global Tobacco Epidemic, 2013. Available from: http://www.who.int/iris/bitstream/10665/85380/1/9789241505871_eng.pdf?ua=1. [Last cited on 2013 Dec 27]. 14. Oberg M, Jaakkola MS, Woodward A, Peruga A, Prüss-Ustün A. Worldwide burden of disease from exposure to second-hand smoke: a retrospective analysis of data from 192 countries. Lancet 2011;377(9760):139-46. 15. Gavarasana S, Doddi VP, Prasad GV, Allam A, Murthy BS. A smoking survey of college students in India: implications for designing an antismoking policy. Jpn J Cancer Res 1991;82(2):142-5. 16. Garipelly R, Garg S, Mateti UV. Emerging doctor of pharmacy program in India: a survey on general opinion of selected educated Indians. J Res Pharm Pract 2012;1(2):48-54. 17. World Health Organization-Tobacco Free Initiative (TFI): questions and Answers on Electronic Cigarettes or Electronic Nicotine Delivery Systems (ENDS). Available from: http://www.who.int/tobacco/communications/statements/eletronic_cigarettes/en/. [Last cited on 2013 Jan 27].